Brent Mountain Protected Area was established on April 18, 2001. It is the only alpine area protected in the Southern Thompson Upland ecosection. Within the protected area is an extensive system of wetlands along stream channels as well as krummholz (very old, low-growing shrub varieties of sub-alpine fir and spruce), subalpine parkland, and subalpine and alpine meadows. A former BC Forest Service fire lookout sits atop the Brent Mountain adding to the recreational appeal of the area which provides a variety of regional outdoor recreational opportunities, including hiking, horse use and snowmobiling. Potable water is not available in the park. Water from the streams must be treated by boiling, using idodine tablets or filtering. The Brent Mountain fire lookout is used as a warming hut when required. Bounded by Broken Creek to the southwest, extending west from the height of land along Sheep Rock and Brent Mountain and encompassing the headwaters of Shingle Creek, Skulaow Creek, June Creek and Shatford Creek, Brent Mountain Protected Area is 22 km west of the city of Penticton. From the intersection of Apex Mountain Road, travel the Shatford FSR for approximately 2.8 km. At the first intersection keep left and travel on the main resource road for another 3.4 kilometres (at this location you will note the Sheep Rock Trailhead). Continue for an additional 1.8 kilometres, keeping left on the main resource road. The road terminates at the main parking area for Brent Mountain. The total road distance from the Brent Mountain Trail Access parking lot to the intersection of Shatford FSR and Apex Mountain Road is approximately 8 kilometres. Note: A vehicle with high clearance is recommended as there are some deep water bars along the road. Many new logging spur roads exist – it is recommended that travel and trail use in this area utilize GPS navigation, compass and topographical maps. This area is an active logging area and be cautious of oncoming logging trucks. Cultural Heritage: Though the area is most well-known for recreation opportunities, there are important natural values present. The alpine meadows contain red-listed lupins and, traditionally, the area was used by First Nations for plant gathering. Brent Mountain offers wilderness recreation for users with knowledge of the area and good outdoor skills. There are well established hiking trails put in by enthusiasts using the area prior to its designation as a protected area. Some signage remains from the Ministry of Forests and trails are marked by fluorescent markers nailed to trees but many need replacement. More markers are needed, as are signs and maps. The Shatford Creek Trail is roughly 10 km. It is well marked and easy to follow with an elevation gain of about 720m to the Sheep Rock alpine area. Sheep Rock is made up of rolling sub-alpine and alpine meadows and affords panoramic views to the Coast and Monashee Mountains as well as the Okanagan Valley. Allow 7-8 hours return. The Brent Mountain Trail is roughly 5 km. It is well marked and leads to the summit of Brent Mountain (2,203m) after an elevation gain of 444m. It too offers rolling alpine meadows and 360 degree views of the Okanagan Valley and the Coast and Monashee Mountains as well as an unused Forest Service fire lookout. Allow 4-5 hours return. Brent Mountain is open to hunting during the lawful game season. Please check the Hunting & Trapping Regulations Synopsis for more information. Though there are no cross-country ski trails in the area, it is close to the Nickel Plate cross-country area. The rolling sub-alpine and alpine terrain offers snowshoeing opportunities but there are no trails or maps. Given the summer hiking times of 4-8 hours return and the lack of facilities, snowshoeing in the protected area must be well planned and visitors well prepared with all necessary equipment. This is a backcountry area and tobogganing opportunities are limited. Sheep Rock has long been a destination for local snowmobilers. 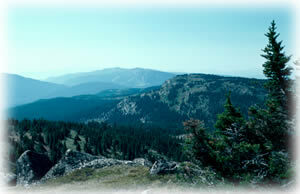 The open terrain provides excellent riding opportunities and breathtaking views of the Okanagan. The fire lookout is a great spot to warm up. Snowmobilers are reminded to take care and avoid damaging vegetation protruding from the snow. There is a Ministry of Forests pit toilet at the lookout.